Technological advancements are changing the performance-cost ratio between stepper motors and servo motors for a growing variety of demanding industrial automation applications. Thanks to the adoption of closed-loop technology, less expensive steppers are making inroads into applications that have been considered the exclusive domain of more expensive servos. Conventional wisdom states that servo control systems are superior in applications requiring speeds greater than 800 revolutions per minute (RPM) as well as applications that require high dynamic response. Stepper motors are preferable in applications that run at lower speeds, produce low to medium acceleration rates, and/or require high holding torque. The conventional wisdom, however, doesn't consider other aspects regarding steppers and servo motors. A stepper motor rotates in steps and uses magnetic coils to pull a magnet in steps from one position to the next. To move the motor 100 positions in a given direction, the circuit steps the motor 100 times. The stepper moves incrementally using pulses and can be precisely positioned without a feedback sensor. The servo motor uses a magnetic rotor that is connected to a position sensor, which continually senses the exact position of the motor. Servos monitor the difference between the motor's actual and commanded positions and adjust current accordingly. This closed-loop system enables the motor to stay on course. Steppers are less expensive than servos and are easier to commission and maintain. Steppers are stable at rest and hold their position, even with dynamic loads. However, as the demands of certain applications increase, more expensive and complex servos must be applied. A crucial difference between steppers and servos is in applications that require knowledge of the precise position of the machine at every moment. In an open-loop, stepper-controlled motion application, the control system assumes that the motor is always moving correctly. However, when a problem is encountered, such as a jammed part that causes the motor to stall, the controller does not know the actual location of the machine, causing it to lose position. The servo's inherent closed-loop system holds an advantage: should the machine snag on an object, it will be sensed immediately. The machine will stop operating and never lose position. Performance differences between steppers and servos derive from their dissimilar motor designs. Stepper motors have a lot more poles than servo motors, thus one complete rotation of a stepper motor requires many more current exchanges through the windings, causing its torque to fall off dramatically as speed increases. Furthermore, steppers can lose their step synchronization if the maximum torque is exceeded. For these reasons, servos are preferred for most high-speed applications. 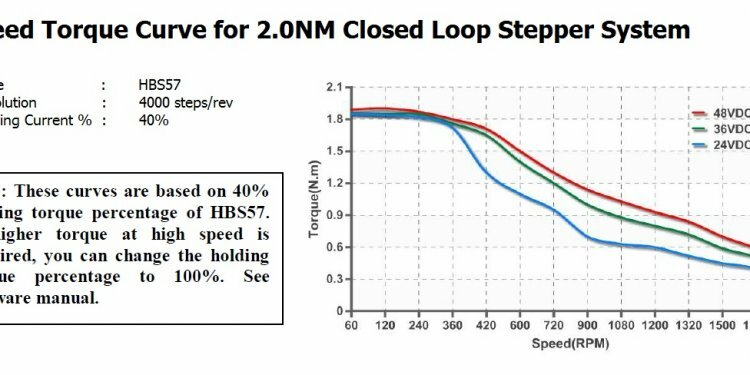 Conversely, the stepper's high pole count has a beneficial effect at lower speeds giving the stepper motor a torque advantage over the same size servo motor. Open-loop stepper motors operate with a constant current and give off a significant amount of heat. Closed-loop control avoids the heat problem by supplying just the current demanded by the velocity loop. Servo control systems are best suited to high-speed applications that involve dynamic load changes like robot arms. Motion control systems that require the properties of servos must justify the higher cost of these motors. Stepper control systems are preferred for applications that require low-to-medium acceleration and high holding torque such as 3-D printers, conveyors, and accessory axes. Because they are less expensive, steppers can lower the cost of automation systems.